I want to mention reusing cold cups instad of simply disposing of them, or better yet, carry a nice reusable cold cup! Most coffee shops that also sell cold or iced drinks will sell cold cups just as they sell hot drink cups. But it’s not so easy as it seems! There’s obviously a different part of the brain associated with carrying a reusable cold drink cup. I say that completely scientifically. I have no trouble remembering to carry a coffee cup, and though I own a nice reusable cold cup, I can’t remember it to save my life. But the payoffs are the same as reusable hot cups when it comes to preventing waste. I don’t kick myself too badly when I’m out & about and don’t have a reusable cold cup for that iced venti Passion Tea Lemonade from Starbucks, but I can make sure to keep that plastic cup, wash and reuse it a couple of times. 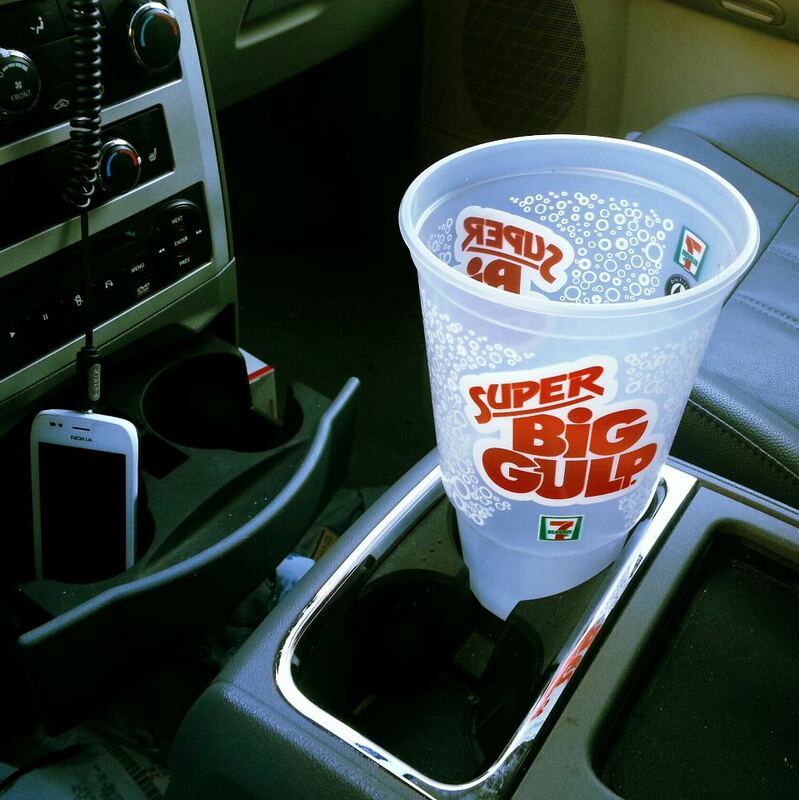 I am trying to break my addiction to Diet Coke right now, so I am using that Big Gulp image as a reminder to, well… “Just say no.” But that doesn’t mean I shouldn’t keep my reusable cold cups handy for the trips to the Starbucks! This entry was posted in Things Disposable and tagged cold cups, recycle, reusable cold cups, reuse. My family is full of Balsamic Vinegar lovers! And in Bethesda you can use a refillable bottle at Bradley Food & Beverage (check out their stunning website, lol) instead of simply buying new bottles every time you need more vinegar! They also have refillable olive oil bottles! I refilled a bottle of Balsamic, today! If you are near enough, check it out and save some bottles! If you live further away, check around and see if someone close to you offers the same! Think of it as an adventure! 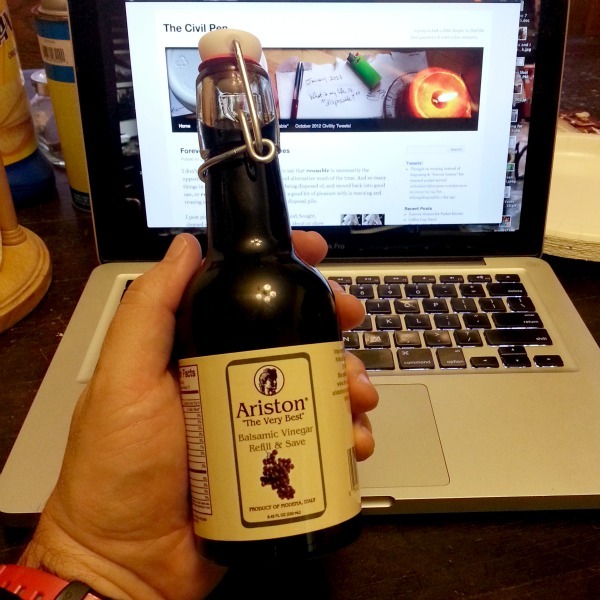 This entry was posted in Things Disposable and tagged balsamic vinegar, recycle, refillable bottles, reuse. I don’t suppose it would be exactly correct to say that reusable is necessarily the opposite of disposable, but it’s surely a good alternative much of the time. And so many things in our lives can be nudged away from being disposed of, and moved back into good use, or reuse. One of the things I have found a good bit of pleasure with is rescuing and reusing old pocket knives on their way to the disposal pile. I post pics on Facebook often of knives I’ve found, bought, cleaned and sharpened. What I don’t often talk about or show pictures of are the “forever homes” that I also sometimes find for the pocket knives. Many come into my hands rusted and dulled beyond safe use… but just a little oil, whetstone work and patience brings them back to a place of purpose and meaning. The Imperial Scout shown here is the knife I’m currently carrying for daily use. I love the older, cheap American made knives, a few of my favorites being Camillus, Camco and Imperial. Though I find a reason to use my pocket knife’s sharpened blade every day, I love a secondary blade with the bottle opener/flat-head screwdriver combo! I use that one as often as I use the sharpened cutting blade. Are you a pocket knife person? Would you be willing to give an old pocket knife a new life of usefulness and purpose? I have joked about making an online adoption site for rescued pocket knives, but I’m not sure I have that much time… in the meanwhile, just let me know and I’ll see if we can find a good match for you! Bottom line, we junk and throw away too many great old pocket knives that can be made useful again, disposing of useful items! I wonder what else we dispose of before it’s time? This entry was posted in Things Disposable and tagged new meaning, new purpose, pocket knife, pocket knives, rescued knives, reuse.